I ran a workshop from my Bristol studio on Monday - it was great fun, and plan to do more. If you fancy having a go at making a mosaic, have a look at my short film, and if you like what you see, get in touch! Nearly my last blog on my font and side panel commission. They are now in situ in the Sacred Heart church in Westbury -on-Trym. The fitting of the font proved to be a challenge, but all went well in the end! This looking at the font alcove from the side, showing one of the two side panels. 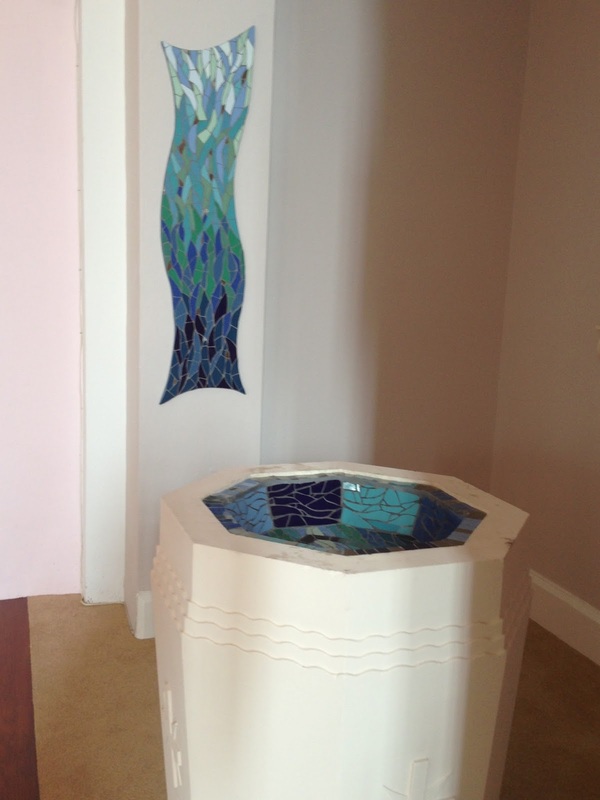 A photo of the font alcove from the front. The newly refurbished church with the font alcove on the left, as we look at it here. I have really enjoyed this commission, and am delighted with the way it has turned out. I am going to get my photographer to take some better photos of it all and create a new page on my website, so hopefully there may be some more commissions for churches coming my way - I will keep you posted! Thanks you for following me on this journey, and I would love to hear what you think of the end result!